New Year Party @ NS Lab 2010 !! 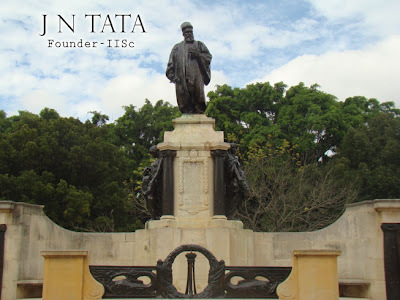 IISc Guest House to JN Tata Auditorium(APBC2010 Venue) !! Prof. Venki Ramakrishnan talk @ IISc !! Venue: JN Tata Auditorium !! A Life in Science !! Informations included: APBC2010 Conference details, Organizers Links(end of each page), Contacts, Volunteers update, Photos and many more..
Advance Wishes to you all !! Welcome back to India !! Garima !! We are all happy to welcome you back to India !! NS Lab Moorthy's: MBU WORK PRESENTATION !! 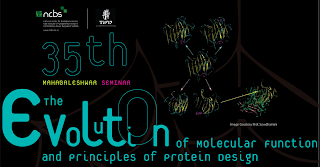 Title : "Stability of domain folds in Multi-domain proteins"
NS @ 35th Mahabaleshwar Seminar !! 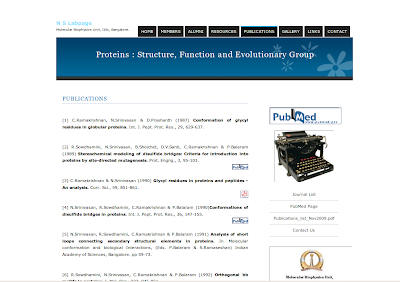 The Evolution of Molecular Function and Principles of Protein Design !! 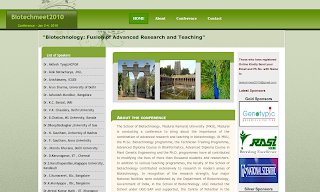 NS @ National Conference BIOTECHNOLOGY: Fusion of Advanced Research and Teaching, Madurai !! 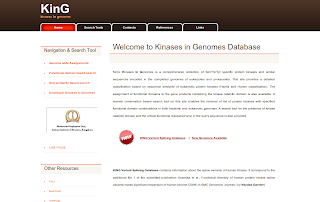 * KING Variant Splicing Database contains information about Human Kinases(http://hodgkin.mbu.iisc.ernet.in/king/cgi/search): The database can be queried using keyword, Kinase family name, Domain name, protein length or Ensemble ID and the results are provided as a table with domain composition details and an image represeting the mapping of the domain organisation along the protein. * Updated genomes(http://hodgkin.mbu.iisc.ernet.in/king2/cgi-bin/new_organisms) Fugu rubripes, Drosophila melanogaster, Saccharomyces cerevisiae, Caenorhabditis elegans, & several Mycobacterium sp. 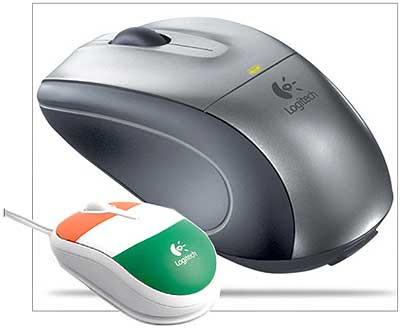 * Website gets cool look !! Statistics: The updated version of KinG holds information for 488 organisms. In KinG v2.0, kinome information is available for 49 archaea, 259 eubacteria, 126 viruses and 54 eukaryotes. 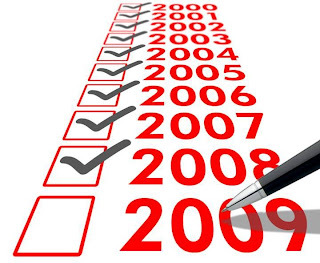 NS Lab Publication List updated Dec 2009!! New short term visitor, Winter 2009 !! B. Tech(Bioinformatics), SASTRA University, Thanjavur, Tamilnadu. Duration: 3 months (Dec 2009 to Feb 2010). 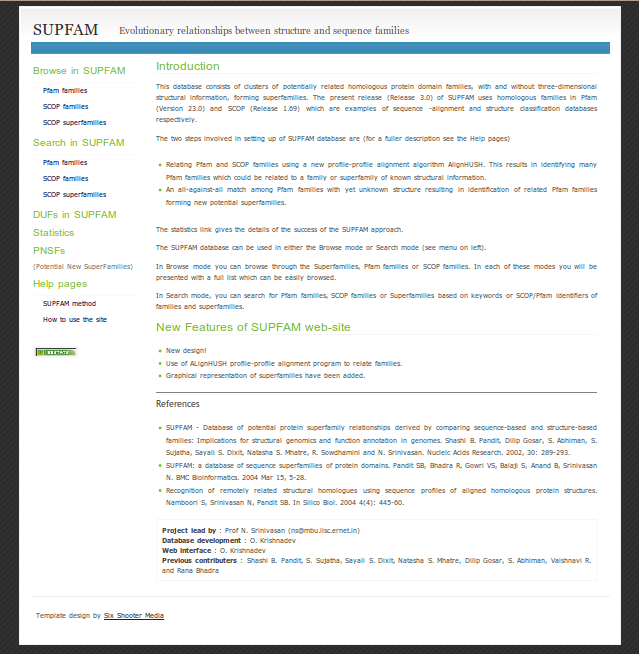 SUPFAM(Inhouse Database) Upgraded & New Look ! 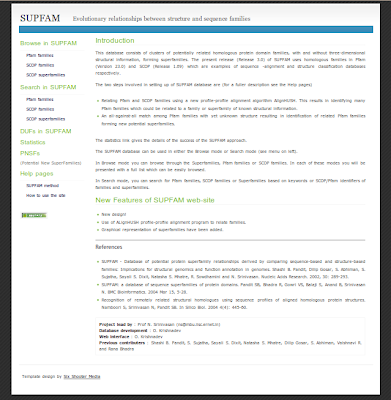 SUPFAM Release 3.0 uses homologous families in Pfam (Version 23.0) and SCOP (Release 1.69) which are examples of sequence -alignment and structure classification databases respectively. * Use of ALignHUSH profile-profile alignment program to relate families. * Graphical representation of superfamilies have been added. In Memoriam – Warren DeLano !! On Tuesday, Nov 3, 2009 Warren DeLano passed away suddenly at his home. He was 37 years old. Warren is the developer of PyMol, an Open Source molecular visualization system that has made enormous contributions to the community and can produce stunning visualizations of Proteins. His impact on the field of protein visualization has been recognized many times by the community and his tools are used in labs all over the world. Warren DeLano was born in Philadelphia, raised in Palo Alto, and educated at Yale University. At Yale, he joined Axel Brunger's lab, where he made critical contributions to the computational tools and methods that made "CNS" a universal computational crystallography program. After Yale, Warren received his doctorate at the University of California, San Francisco under the mentorship of Jim Wells, PhD. He then became a founding scientist at Sunesis Pharmaceuticals, creator of PYMOL, and founder of DeLano Scientific. Throughout his life and career, Warren made fundamental and highly valued contributions to science. His Open Source PyMOL software is widely used throughout the world, and nearly all publications that display macromolecular structures use PyMOL. 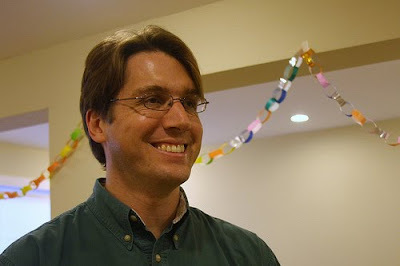 He was a strong advocate of freely available software and the Open Source movement. He also encouraged all who came into his lab or office. His sunny, optimistic outlook endeared him to all he knew; his brilliance awed and inspired many throughout the scientific and software worlds. He is survived by his wife Beth Pehrson, mother Margaret DeLano, father James DeLano, Jr., step-mother Cathy Groves DeLano, step-father Tom Snouse, sister Jennifer DeLano and brother Brendan DeLano, as well as three aunts and eight cousins. A memorial will be held in several weeks – we will update this site as soon as information is available. MSS literature presentation of Ms Richa Mudgal from NS Group on 11th Nov 2009 !! 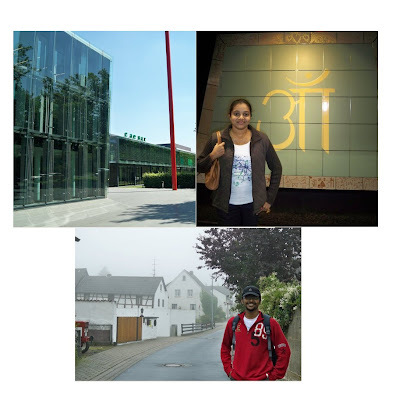 Title : "Classical to Modern Views on Constraints in Protein evolution"
Dinesh D C and Yamunadevi S back to NS group after 3 months Internship @ Bonn, Germany. Dinesh D C and Yamunadevi S @ Bonn, Germany. 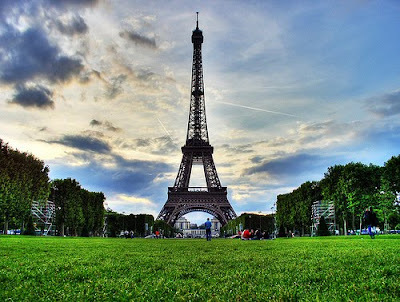 NS @ Paris with Garima, Agnel and Jeyashree !! Agnel, Garima, Jeyashree and NS. Welcome to India !! NS !! For more details, please visit http://www.bioinformatics.org/wiki/Inbix10. There are various speakers of repute in the area of Systems Biology and Bioinformatics. Registration starts October 15, 2009. Stay tuned for more announcements. If you are a group of 15 or more, you can form a virtual hub. This is organized by Bioclues.org and Bioinformatics.org. Garima Agrawal(PhD student @ NS Group) visits Alex de Brevern's Lab, Paris !! NS moving to France !! Diwali Wishes to you all frm NS Group..
Top ranking for Indian Institute of Science, Bangalore !! Since 2004, the Ranking Web is published twice a year (January and July), covering more than 17,000 Higher Education Institutions worldwide. Web presence measures the activity and visibility of the institutions and it is a good indicator of impact and prestige of universities. Rank summarizes the global performance of the University, provides information for candidate students and scholars, and reflects the commitment to the dissemination of scientific knowledge. The Indian Institute of Science in Bangalore has been rated the best in South Asia in terms of visibility and scholarly papers on the net in the latest ranking of such institutions by Cybermetric Lab, the largest public research institution in Spain. The Indian Institute of Technology in Mumbai, the National Informatics Centre in Bangalore, the Indian Institute of Technology in Kanpur and the Tata Institute of Fundamental Research in Mumbai make up the top five universities in the subcontinent. In fact all the top 10 slots are for institutions in India, with two universities in Sri Lanka - University of Moratuwa and University of Colombo placed 10th and 11th on the list. The highest ranked institution from Pakistan is the Lahore University of Management Sciences at the 17th position. The other names in the top 10 are: The Indian Institute of Technology in Chennai, the International Institute of Information Technology in Hyderabad, the Indian Institute of Technology in Delhi, the University of Delhi and the Indian Institute of Technology, Kharagpur. 'Candidate students should use additional criteria if they are trying to choose university. Webometrics ranking correlates well with quality of education provided and academic prestige,' said a statement from Cybermetric Lab. A total of 15,000 universities globally were analysed, of which about 5,000 were ranked in the list. The Massachusetts Institute of Technology in Boston, US was the top-ranked university in the world with the rest 20 positions also held by American universities. Visiting Professor at the Indian Institute of Science (IISc) Bangalore Venkatraman Ramakrishnan wins Nobel Prize for Chemistry 2009 !! Venkatraman "Venki" Ramakrishnan (Tamil: வெங்கட்ராமன் ராமகிருஷ்ணன்; [Homepage] born 1952 in Chidambaram, Tamil Nadu, India) is a structural biologist at the Laboratory of Molecular Biology of the Medical Research Council located in Cambridge, England. He is a Fellow of Trinity College, Cambridge and a Fellow of the Royal Society. He was awarded the 2009 Nobel Prize in Chemistry, along with Thomas A. Steitz and Ada Yonath. WATCH VIDEO: Professor Umesh Varshney Interviewed !! 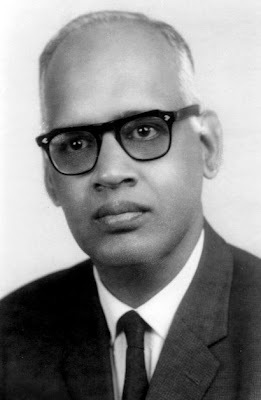 Professor Venkatraman Ramakrishnan's friends in IISc, Bengaluru. Professor Umesh Varshney from the Indian Institute of Science provides a fascinating glimpse into the scientist who won the Nobel Prize for Chemistry 2009. NDTV LINKS: Nobel winner likes masala dosas !! Indian-American Venkatraman Ramakrishnan, 57, has won this year's Nobel Prize in Chemistry, the Nobel Foundation announced on Wednesday. He shares it with Thomas Steitz, an American, and Ada Yonath, an Israeli. 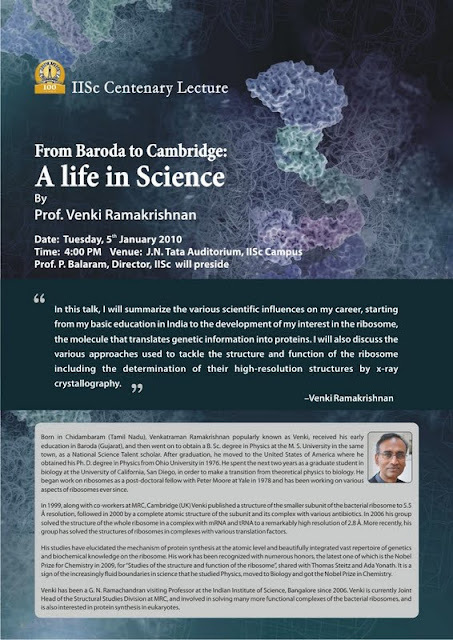 Well known as `Venky' in India's scientific circles, Ramakrishnan, has been a visiting lecturer at the Indian Institute of Science (IISc) Bangalore, for many years. He was born and schooled at Chidambaram, Tamil Nadu and graduated from M.S. University in Vadodara, Gujarat, before moving to the United States for his Ph.D. from Ohio University. He is the seventh person of Indian origin to win the Nobel. "People here are very excited," said P. Balaram, director of IISc. "His is one of the most magnificent pieces of work in structural biology." The three scientists won the prize for their research into ribosomes, which are proteinproducing structures found in all cells. Ramakrishnan used X-ray crystallography -- the same method used by the discoverers of the DNA -- to map the thousands of microscopic atoms that make up a ribosome. 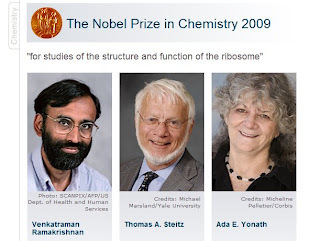 The Nobel committee described ribosomal protein synthesis as "one of life's core processes." Antibiotics based on Ramakrishnan's model will save lives and decrease suffering, the Committee added. Access the latest research from Rapid Research Notes (RRN), a new archive of the National Library of Medicine. RRN provides permanent access to research shared through online resources for rapid scientific communication. 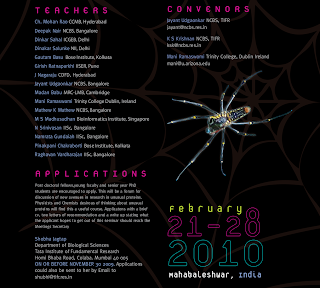 PyCon India 2009 @ IISc, Bangalore !! Pycon India 2009 is a community conference by the Python developer community. A purely volunteer effort, it is being hosted for the first time in India, and will attract some of the best Python developers in India and abroad. Pycon India 2009 would be held in Bangalore, India, between Saturday, 26th September 2009 and Sunday, 27th September 2009. Pycon India is a volunteer run conference making Pycon India 2009 reliant on sponsorship to help turn it into a successful and memorable event. The conference will consist of a number of full length presentations, a number of shorter lightning talks and open sprints and BoFs. Bacteria are the most dominant form of free-living life on earth. Many bacterial live in multiple habitats each offering its own set of nutrients and adversaries. As part of adaptation to a given habitat bacteria make use of numerous signal-transduction mechanisms largely leading to a change in the transcriptional status of the cell. This is best exemplified by the metabolic system whose regulation can be conceptualised in the form of at least two genome-scale networks - one describing the metabolic system itself and the other icluding its regulators. Aiming to present an overview of our wholly computational work into signal-dependent regulation in bacteria, I will present a computational, functional genomic study of the architecture of genome-scale networks describing regulation of metabolism by small-molecules. Bacterial gene regulation goes beyond specific, signal-dependent control, and includes large-scale, global regulation by histone-like / nucleoid-associated proteins. I will briefly present initial work, on three such proteins in E. coli, that make use of genome-scale experimental approaches. This will lead on to thoughts on future directions. The Asia-Pacific Bioinformatics Conference series is an annual forum for exploring research, development and novel applications of Bioinformatics. 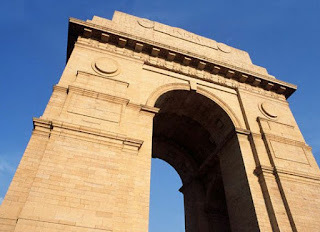 The Eighth Asia-Pacific Bioinformatics Conference, APBC2010, will be held in Bangalore, India. looking forward to see you all there !!!!!!! After the overwhelming success of Thirkan, the previous showcase, we are back to thrill you with an electrifying evening of Dance. Join us and groove to the beats of a variety of dances - including Regional, Ballroom, Latin, Classical, Bollywood and many more! MBU Fresher´s Party on 11th September'09 !! Lets all welcome Sudha G once again to our group & other new MBUites!!! MBU DAY and NIGHT, Friday 28th August, 2009 !! Looking forward to your active and enthusiastic participation !!!!!!!!!! 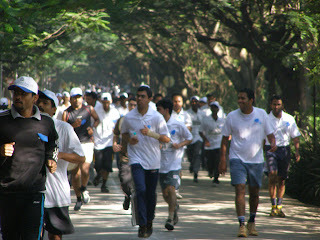 IISc "FREEDOM RUN" 2009 !!! organizing "FREEDOM RUN" 2009 tomorrow at 6.30 a.m.
who can participate? - Students, Faculties, Staff and their childrens. children category for both Men and Women. Come and join together as we are "ALL FOR ONE AND ONE FOR ALL". 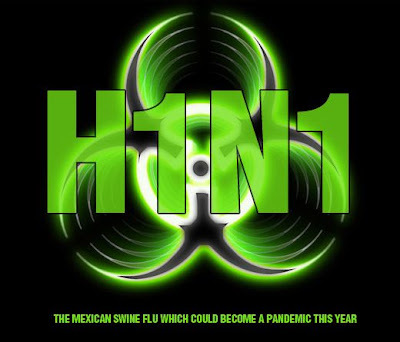 H1 N1 influenza is a new viral disease other wise called swine flu first detected in April 2009 in USA. It is a global disease and already in INDIA. It affects primarily younger and older people. Symptoms in children: 1) Fever throat pain , cold and cough. 2) Fast breathing or difficulty in breathing. Symptoms in adults: 1) Difficulty in breathing. 2) Chest or Stomach pain. It spreads mainly by person to person through infected droplets expelled by coughing or sneezing of infected person. The treatment for this H1 N1 virus is available in INDIA. The drug is Oseltamivir (Tami flu) available only at recognized centers in Bangalore. It is used strictly under medical supervision. The testing is also done in these centers including NIMHANS where throat swab is taken from strongly suspected person for finding Swine flu virus. At present, new guidelines from the Central Government is clearly specify that only those on international travel history or contact with confirmed positive cases need to be quarantined and there throat swab is sent for testing, simple merely cough and cold, fever need not rush to hospital for checking for swine flu, only if persistent symptom and sore throat, high fever, myalgia and breathlessness need to be attended immediately. In these cases in doubt it is requested to meet Medical Officer at Health Centre. The experts say that swine flu is mild self resolving disease and in 98 % cases rest and general treatment is enough to recover. H1 N1 flu is not as dangerous as it thought to be it is like any other flu and not to be panicky. It is advisable to take following precautionary measures. There is no vaccine available right now to protect against swine flu. Chief Medical Officer, IISc, Bangalore. Eclipse @ NS group !!! 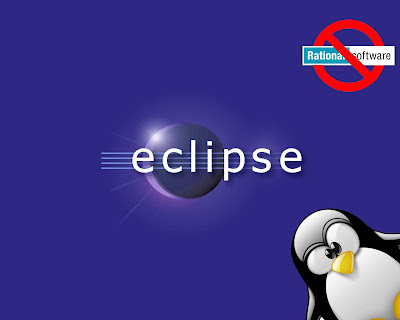 Eclipse is a multi-language software development environment comprising an IDE and a plug-in system to extend it. It is written primarily in Java and can be used to develop applications in Java and, by means of the various plug-ins, in other languages as well, including C, C++, COBOL, Python, Perl, PHP, and others. 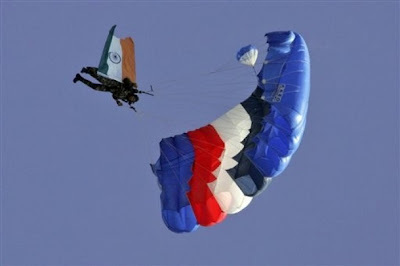 INDEPENDENCE DAY CELEB @ IISc 2009 !! front of the Main Building at 8:25 AM. Advance wishes to you all..
MBU Day!!! 28th of August, 2009 !! Friday !! 28th of August !! Friday, 2009. Prof. G. N. Ramachandran's statue @ University of Madras !! She has joined Institute of Bioinformatics(IOB), Bangalore !!! Congrats and All the best !! From all of us !! 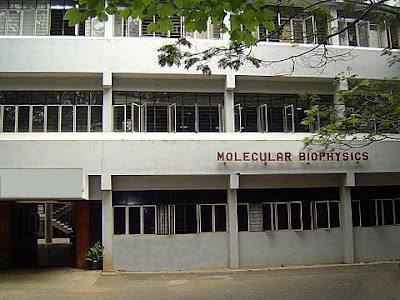 New Assistant Professor at Molecular Biophysics Unit, IISc !! Dr. Rishikesh Narayanan has reported as Assistant Professor at Molecular Biophysics Unit, IISc, today (30.07.2009). 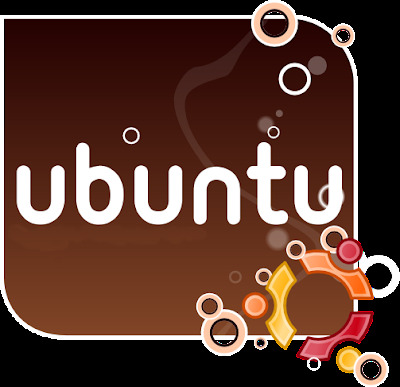 NS Grp: Getting updated with Ubuntu !! !